The head louse is a tiny, wingless parasitic insect that lives among human hairs and feeds on extremely small amounts of blood drawn from the scalp. 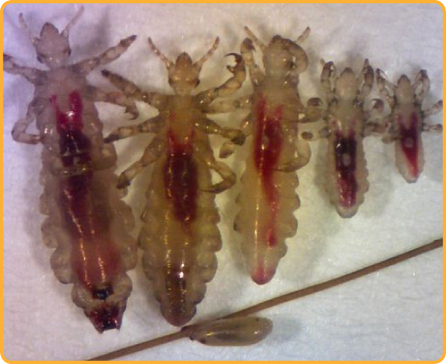 Although they may sound gross, lice (the plural of louse) are a very common problem, especially for kids ages 3 years to 12 years (girls more often than boys). Having head lice is not a sign of uncleanliness or poor hygiene. The pesky little bugs can be a problem for kids of all ages and socioeconomic levels, no matter how often they do — or don't — clean their hair or bathe. Wash all bed linens and clothing that's been recently worn by anyone in your home who's infested in very hot water (130° F [54.4° C]), then put them in the hot cycle of the dryer for at least 20 minutes. Have bed linens, clothing, and stuffed animals and plush toys that can't be washed dry-cleaned. Or, put them in airtight bags for 2 weeks. Vacuum carpets and any upholstered furniture (in your home or car). Soak hair-care items like combs, barrettes, hair ties or bands, headbands, and brushes in rubbing alcohol or medicated shampoo for 1 hour. You can also wash them in hot water or just throw them away. Because lice are easily passed from person to person in the same house, bed mates and infested family members will also need treatment to prevent the lice from coming back. Will They Ever Be Gone? There's no doubt that they can be hard bugs to get rid of. If your child still has lice 2 weeks after you started treatment or if your child's scalp looks infected, call your doctor.